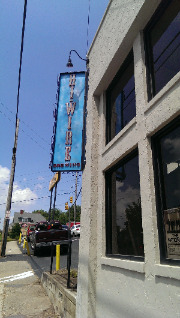 Thursday Brewery & History Walking Tours start at 5:30pm at Hi-Wire Brewing Company at 197 Hilliard Avenue on Thursday afternoons. Free parking is available along Coxe Avenue half a block from Hi-Wire Brewing. The tour will last two hours and finish at Catawba Brewing on Banks Ave.
After we enjoy Hi-Wire Brewing, the tour will wind through the streets of downtown Asheville to Catawba Brewing, one of the pioneers in Western North Carolina's craft beer industry. Both stops will include a sample flight of beers to enjoy.